The liquid marinade consists of just soy sauce, and healthy lemon juice. The soy sauce used is sugar and gluten free. Lemons offer many health benefits. 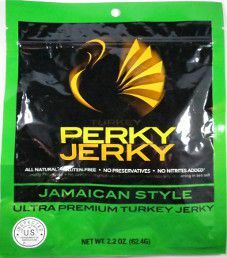 Easily the most interesting ingredient used is guarana, which you could say is how the Perky Jerky brand name was created. Guarana is made from seeds of a shrub from the soapberry family. It has similar effects as caffeine, which acts as a stimulant. It is more common to see guarana used in energy drinks. 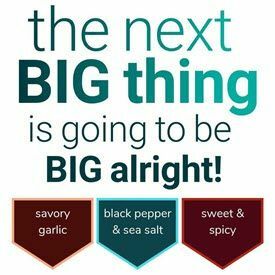 There are several healthy ingredients added such as garlic, black pepper, onion, allspice, cinnamon, red pepper, jalapeno pepper, and ancho pepper. Hot peppers are healthy if eaten in moderation. The sugar level is high at 8 grams of sugar per 28 grams of jerky. Our preference is 3 grams of sugar or less. The salt level is just a bit high at 370mg of salt per 28 grams of jerky. Our preference is 350mg or less. These strips are a mixture of medium and small sized. They are sliced to a medium-thin thickness. 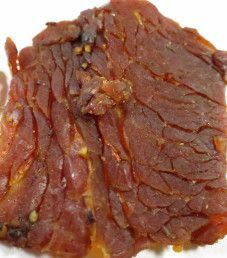 This jerky does qualify to have a soft and tender texture, which makes for easy chewing. 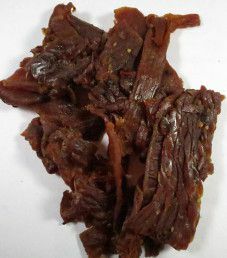 There are no visible signs of fat, and handling this jerky leaves no oily residue on your fingers. The first taste detected is a moderate level of sweetness, a bit too high actually. There is a mild soy taste, and this flavor is mildly salty. The lemon flavor is at a mild level. While not entirely consistent, there is a light to mild peppered flavor. The turkey itself tastes very good, and there is a light onion/garlic combination. There is some heat to this flavor, but not consistent from strip to strip. On a heat scale, it would rate a 1 or 2 out of 4 depending on your tolerance of spiciness. There is a light cinnamon taste that blends in nicely with the other flavors. Overall, an interesting tasting flavor, just a tad too sweet. This 2.2 ounce/62.4 gram bag of jerky was purchased for $5.49. That equates to $2.50 an ounce, which classifies as an expensive price. 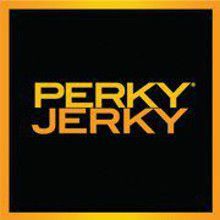 This jerky is recommended for people who enjoy a sweet and spicy based flavor. 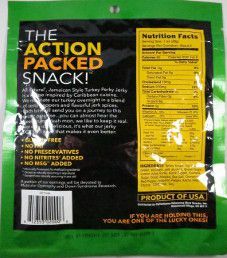 Some slogans printed on this bag are “Ultra Premium Turkey Jerky”, “The Action Packed Snack!”, and “If you are holding this, you are one of the lucky ones!”. Facts printed on this bag are “No Fat”, “All Natural”, “No Preservatives”, “No Nitrites Added”, “No MSG Added”, “Product of USA”, “Minimally Processed”, “Gluten-Free”, “No Artificial Ingredients”, and “All Natural”. All bag categories are covered here with one exception. This bag has no transparent window to view the actual jerky. There is a good blurb written on the back about this jerky. It is also stated on the bag that “A portion of our earnings will be devoted to Muscular Dystrophy and Down Syndrome Research”.